Generally speaking, I’m finding this whole blogging identity thing pretty cool. But a major downside for me is that I can’t share any of my art on this blog. I have a pretty unique style, and it would be a pretty dead give away that it’s me. I have a small following on the internet largely from an online store, so finding those same pieces in store under my real name on this blog is a pretty easy connection to make, and all it would take is using google chrome’s search function where you drag an image into the search bar and it seeks out all the versions of that image, as well as similar images. My family is pretty into my art as well, so that would open it up to them finding it as well. I guess it wouldn’t be the end of the world if my family found my blog, but I just feel like it would be hard to explain to them. My primary concern is still employers finding me though, in which case I don’t think sharing my art here would impact that very much since an employer would likely just be searching my name. Another downside? I can’t share my amazing cat with any of you! He is the best cat ever. I’m sure everyone says that about their cat, but I am right. Oh well. Maybe I’ll be more comfortable sharing more details from my life here eventually, but for now I’ll keep those things separate from the blog. 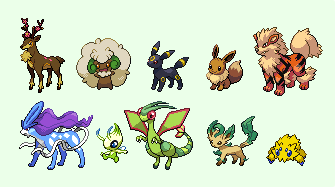 What I will share with you right now though is a picture containing my top 10 favouirte pokemon. I’m not entirely sure of its accuracy at the moment… it might need a couple of changes. But it’s pretty close anyway! I’m not sure if Eevee belongs in the top 10 anymore… I really love it, but there are others that I think are considerably cooler. Eevee is just kind of special though, I’ve trained it so many times! My top 10 list doesn’t have very much to do with how strong the pokemon is in game, it generally has more to do with its design, pokedex entry, and what my imagination does with it. My imagination runs wild with riding Flygon through a desert, having Eevee lay on my lap, riding Arcanine across a field, or having Joltik crawl up onto my shoulder. I don’t really care who considers pokemon a kid’s game, me and my imagination love it. 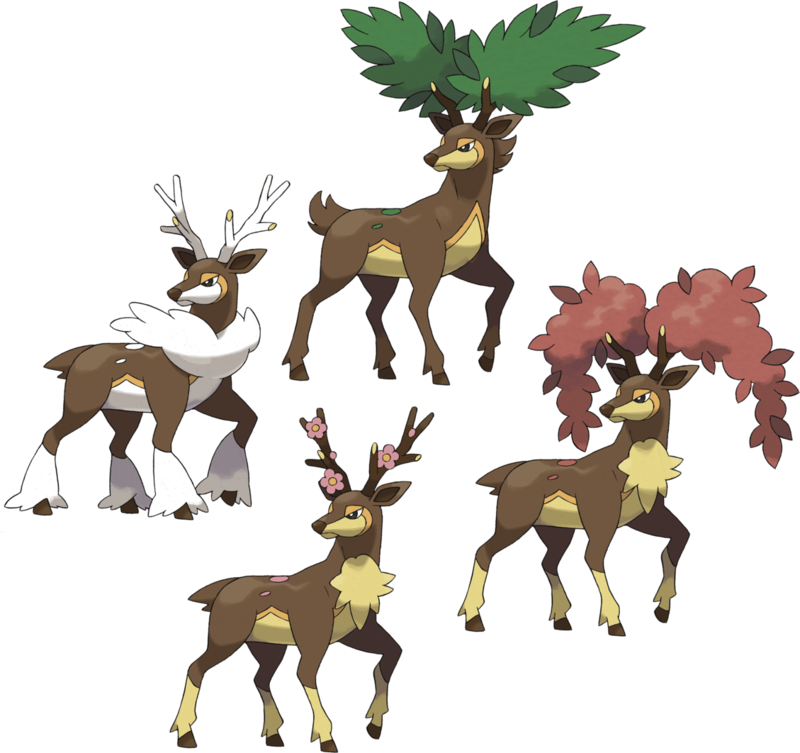 One of the reasons I love Sawsbuck so much is because its appearance changes with the seasons in game. Autumn form (on the middle right) is my favourite. It’s also fairly complicated when you get into training pokemon to battle real people outside of the game. The four moves you choose need a lot of synergy with one another, and each pokemon on your team fills an individual role in order to create a balanced party (the lead pokemon, the wall, the tank, the attacker, etc). I haven’t even started on “effort training,” which I now do with almost every pokemon I train. When you defeat another pokemon, you get an effort value from it. Effort values determine which stats will increase when you level up (to put it simplistically). let’s say I defeat 10 geodudes. Geodude have good defense, and when you defeat them your pokemon gets 1 defense effort value. Eventually, if you beat many geodudes, this is going to impact the amount of defense your pokemon gains as it levels up. Unfortunately you never learn about any of this in game, it’s something you have to look up on the internet if you want to utilize it. There’s a lot of info about effort values I didn’t not include here because I figured that would be pretty boring for most readers here (this post is already so self indulgent!) but if anyone it actually interested the information is easily found with a quick google search. Bulbapedia is great for all things pokemon. I’ll try to put up a review for an anime soon. I haven’t really felt like it yet, but I’ve been feeling like it more and more, so hopefully in the next week or so it’ll be posted! Perhaps another bra review as well? I think so.